The worst part about thinking I might die was You. It’s like all I wanted was your comfort. If that was the end? I wanted you to be with me. Even if only in spirit. Instead I have nothing. I reached our. But I also did that knowing there was a 99.9% that i would be ignored. I imagine the next time someone contacts you regarding me will probably be my death. Which is either coming soon. Or is a long way down the road. So much so that contacting you will not be realistic. If I hadn’t accepted reality. I sure as hell have met it head on this time. 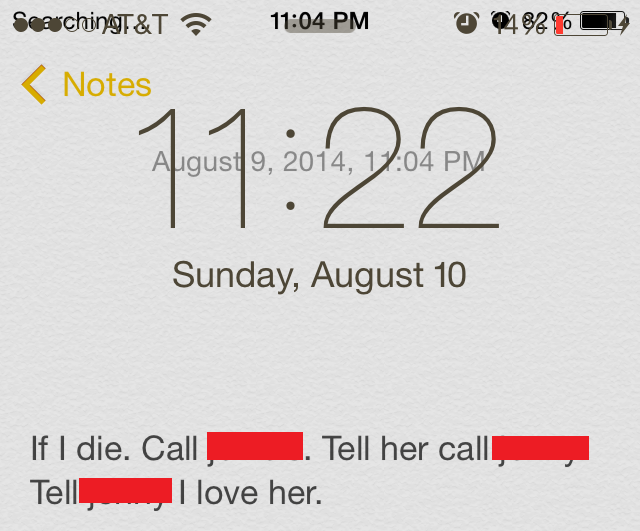 Of course it’s me that is about to pass out and writes the above message on my phone in case I die. Sure enough after I wrote that I alerted the nurse. & Promptly lost consciousness. Mustered every ounce of energy I had left to leave a message that would fall upon deaf ears. I’m done for. I’ll just try to enjoy the rest of this as much I possibly can. I want to feel the softness that changed my destiny. I want you to live while I wait for you, asleep. to continue to walk on the sand we walk on. so that everything can learn the reason for my song. Next Next post: Third time the charm?